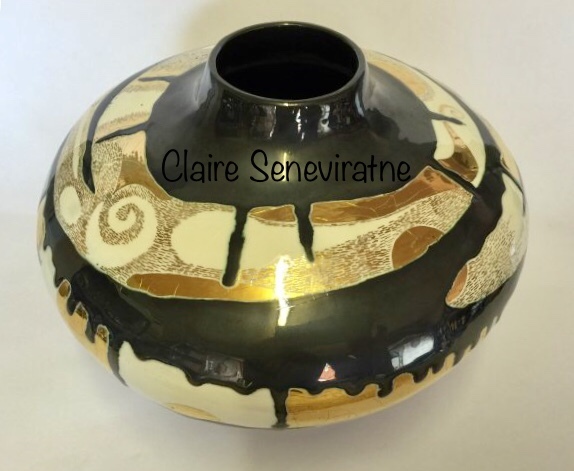 Claire Seneviratne - Ceramic Artist: Ceramic pot with gold lustre. Ceramic pot with gold lustre. Ceramic pot with gold lustre. A beautiful pot with elaborately hand painted glaze and gold lustre. From the 'setting sun' series. Height 16 cm and width is 21 cm. If you would like to see this pot in more detail I have a video of it in my blog/vlog section which is situated on the home page at the top right hand side. it is video 41.